Kevin: And we have hit our third anomaly of the week, and I think I have hit upon what eventually becomes so annoying about them. On TNG, the week's phenomenon had a lot of leeway. It could be dangerous or interesting in a broad number of ways. On Voyager, they usually take the shape of either a potential energy source or a way home, so that makes them feel repetitive. I think since they are starting from what the anomaly has to do for the plot, they tend to feel contrived. This wormhole feels very specifically constructed to produce exactly the set of problems it causes. What are the odds, even in a Star Trek sense, that there is a wormhole from that place in the Delta Quadrant and that it (1) goes to the Alpha Quadrant, but (2) to the wrong part of the Alpha Quadrant, (3) is too small to travel through, (4) allows transport, but (5) through time on a scale that makes the trip worthless, and (6) that it contacts a sympathetic but (7) short-lived Romulan? That's just one or two too many qualities this wormhole has to drive the action. I also think there is a concern that this will devolve into Gilligan's Island, and the ship always have a way home snatched from them at the last second. Much like imperiling the life of a main cast, I usually know they will be fine, so something else has to sustain the drama since I don't really believe they will get home. Matthew: I've seen this episode at least 4 times now, so it is safe to say that I am not surprised by the twist. I think, perhaps, that the first time you see this, it is a somewhat interesting story wrinkle, the time displacement. But they really didn't do much interesting with it. The sci-fi questions abound (e.g. the paradox of warning oneself not to reach the situation in which one warns oneself, the potential for someone to travel back with the Romulan and having to avoid their younger self), and none of them are answered. I do think there is a problem with getting to this episode so soon in the run of the series. It makes such anomalies seem, well, not very anomalous, and it calls into question why they don't just find one that makes good within 6 months or so. The Gilligan's Island concern is a valid one, but it is ameliorated if a good character story is told, which we'll get to below. Can I just ask why they had records of the death of a minor Romulan scientist on board Voyager? Did they grab a cache image of the entire Galactic Internet before they left? Also, why would a Romulan scientist be able to rattle off a Gregorian calendar date with hardly a second thought? Stardates would have made much more sense (and no, they're not the same thing...). Kevin: Contrivance aside, I liked seeing individual reactions to even the oblique possibility of getting a message home. The look on Janeway's face when Tuvok reveals that the Romulan died before they left was great. It was interesting seeing everyone trying not to get their hopes up. Beyond that though, I thought the episode lacked a little punch and suffered a bit in the pacing department. Maybe they spent a tad too long on the back and forth with the Romulan not believing their story. Matthew: Yeah, I think the episode would have been better served by focusing on the messages people would have sent. I liked the dialogue between Kim and Torres, talking about their lives back home. Kim's stuff isn't really much of an elaboration on his established family life in Caretaker, but Torres gets a lot of new background, with her divorced biracial parents, her estranged mother, and her feeling of family connection with her fellow Maquis. 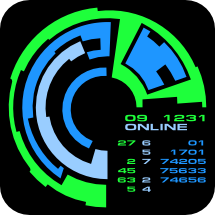 If this had been done for more characters, we could have gotten a lot of great stuff. Janeway writing a letter to Mark, or Paris wrestling with his father's expectations, for instance. Long story short, the (quasi) science of the A story was much less interesting than the emotional repercussions for the characters, and it was really the focus of much of the action. Kevin: I liked that they have progressively worked up toward an explicit discussion of the Doctor's status. Kes works with him and is fond of him, and that may be coloring her perception, just as Janeway's limited interaction colors hers. Much like Data, I think they eventually do kind of skip over the question somewhat quickly, but it's nice to see it not taken as a foregone conclusion from the first episode. I particularly liked Janeway offhandedly discussing reprogramming him, and it is a nice concise, and in retrospect, somewhat chilling way to demonstrate how the crew thought of him. Matthew: You're right, there is a basic sci-fi question here that is hinted at in this episode, and that's a good thing. This episode can't be faulted for the fact that the question of the Doctor achieving sentience was elided by future shows. I think this may have benefited, as you say, with the Doctor being more of a cipher, and the other crew projecting their expectations on him. It was made rather obvious that he has feelings of some sort here, and thus is worthy of concern and care. That's not necessarily a bad story choice, but it isn't the most interesting one, to my mind. Kevin: Much like last week's The Cloud, this episode doesn't suffer in this department. Like I said, the look on Janeway's face when she realizes R'Mor is already dead was pretty great. What is it with her and getting emotional in the transporter room? Everyone did at least a competent job portraying the range of responses to the thought of getting home or at least a message there. I also really enjoyed the scene with Kes and the Doctor. They have good rapport and his request to not be left on was just a little bit heartbreaking. Matthew: This was another good Jennifer Lien episode. This episode shows that in the series, the writers missed an opportunity to use Kes as an outside observer on humanity, poking and questioning at their self-image of compassion. I agree on her chemistry with Robert Picardo, too. Hmm, kind of interesting that the Seven of Nine character would pretty much do exactly the same thing, just with a harder edge (and, well, you know). Definitely agreed on Kate Mulgrew. She was good in her Doctor conversation and nightie scene, too. The nightie scene must have been challenging, without an actor on set to work against. Kevin: Vaughn Armstrong is the guest star extraordinaire, but he doesn't quite do it for me here. I generally bought his skepticism transitioning to belief, but somehow, the character read as flat for me. Maybe the absence of real stakes on his side of the equation left the character without much to do. Matthew: Armstrong can come across as very stoic and closed. I think that works for a Vulcan, but maybe not for a Romulan. Kevin: This is a bottle show, save for the wormhole effect, which I was not in love with. I get that the wormhole was supposed to be small and I wasn't expecting a redo of the Bajoran wormhole interior, but this one seemed a little lackluster. Maybe it's that it, more than any effect thus far, shows a certain creakiness as being mid-90s CGI. Matthew: I liked the wormhole effect, personally. I agree that it is obviously CGI, but it was visually interesting. The transport canister had blinking lights and transparent doo-dads, so I think that was interesting, too. Kevin: The Romulan make-up for R'Mor was fine from a techinical standpoint, and it's not as bad as the Vulcan makeup on John Shull in Shakaar, but it's certainly not my favorite look for Armstrong. He makes a much better Cardassian. 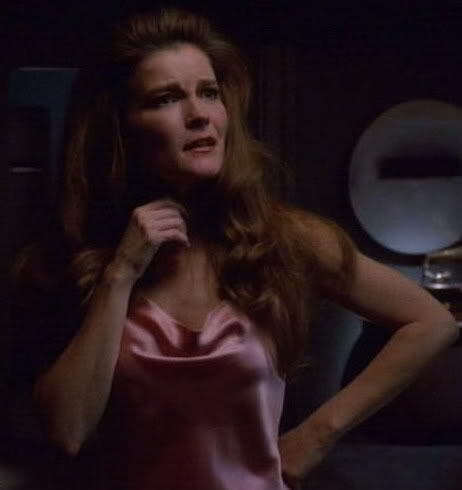 Matthew: Janeway's quarters give us pretty much the first bed that looks really sleepable in the franchise. I like the dressing of her quarters, too, including the gramophone. There was a really tasteful use of accent lighting. Her nightie was interesting, but I really wonder about pants on such an outfit. Kevin: I am going with a 3. The plot is a touch contrived for me, and overall the episode feels a little slow, but since it's the first time they are teased with the ability to go home, I can't fault the plot for being repetitious, and the scenes with the Doctor are cute and building a character well. The sum of the episode puts it well into average territory for me. Matthew: I agree on the 3 for a total of 6. The twist is only marginally interesting, but what character stories we do get are good, and the Doctor element is nice as well. Had either been expanded, this might be a 4. But as it is it's an average hour of Trek, all told. This is one of my favorite episodes of the first season. I agree that the timing of this episode wasn't great, both because it's yet another anomaly, but also because it seemed early to be teased with a way home. So I'm with you in thinking the initial discovery was a little contrived, because it's very unlikely they would find something like this leading to the Alpha Quadrant. And once they find it, it's a given that they wouldn't really be able to get home. But all of the plot points aside from that aren't convenient, and each provides an interesting emotional layer, which, to me, makes it far from contrived. I think they managed to capture disappointment and even a surprise in a story where the audience knew they weren't going to get home, which is pretty hard. My thing about the "one in four" chance is this: what about the rest of the universe? Wormholes can join any two points in spacetime. Shouldn't it be like a one in a quintillion shot? I like the space anomaly episodes a lot, actually. In fact, they constitute some of my most favorite plots/episodes and they offer a counter balance to other kinds of plot lines. Moreover, encountering space anomalies, "strange new worlds" so to speak, is what, among other things, makes space travel and exploration so interesting, right? Especially since Voyager is new to this uncharted part of space, the Delta Quadrant. Space anomalies are part of space travel and for a writer I can imagine that the possibilities are endless with themes that can be explored. That said, I have always found those "going home" episodes in Voyager a bit superfluous in the sense that we all know it will nor work anyway since if they really did go home, the show would be over. On the other hand, I think these kinds of episode on VOY have never actually BEEN superfluous since the writers used that angle to fold into the story some bigger, more overarching themes or conflicts or character developments etc - such as in Prime Factors where the crew and especially the captain found themselves on the receiving end of the prime directive by another culture. Everyone (i.e audience) knew they werent gonna go home but exploring the dilemma they were facing, Torres disobeying direct orders, Tuvok collaborating with her and Seska and so forth expanded the story, and its characters, beyond just "another pointless episode about trying to go home". All this made Prime Factors an effective, rich episode for me. Just as this one here. We find out about the crew's desire to go home, we are reminded that these people are still looking for a way home instead of just going exploring like they were in the Alpha Quadrant. The continuity is there and is not given up on. I also like how the character of Janeway is further developed and explored: the way she danced around the Romulan, painfully diplomatic (I personally would haven been sore the next day), the look of despair and disappointment on her face after he beams off and Tuvok gives her one bad news after another....her resolve afterwards and the way she pulls herself together to continue to go on and find a way home. Janeway's strength was truly shining through and showed us that while she can be vulnerable, she can also be strong and resolved if need be. This episode added another layer to her character. The space anomaly plot is secondary in a way - this is an episode about the Voyager crew and how they handle life in the face of such grave disappointments etc. I agree with your analysis. But I would add that I like anomalies better when the science behind them is somewhat close to realistic (which it sort of is here), and when the anomaly itself is not superfluous to the overall episode. So, for instance, this episode is way better than "Twisted," because there, it was just a generic obstacle (with the lamest Trek Trope ever solution... wait it out), based on no real science, that precipitated no real character growth.